novels by Ian Rankin. 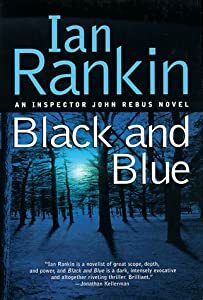 They were Let it Bleed, Black and Blue, and The Hanging Garden and are collectively described as ‘The Lost Years.’ In Black and Blue Rebus goes on the wagon, and it made be wonder why it is that so many ‘heros’ are dysfunctional being either alcoholics, or drug users or mentally unstable. In real life, our experience is that with any of those problems, the individual’s ability to process information, to act rationally are impaired. We only have to think of the effect on driving abilities after drinking alcohol to understand that. Yet these fictional characters seem highly competent. Why do we, as readers’, accept behaviour in fiction that we would deplore in our friends and family? Has anyone any thoughts on this?